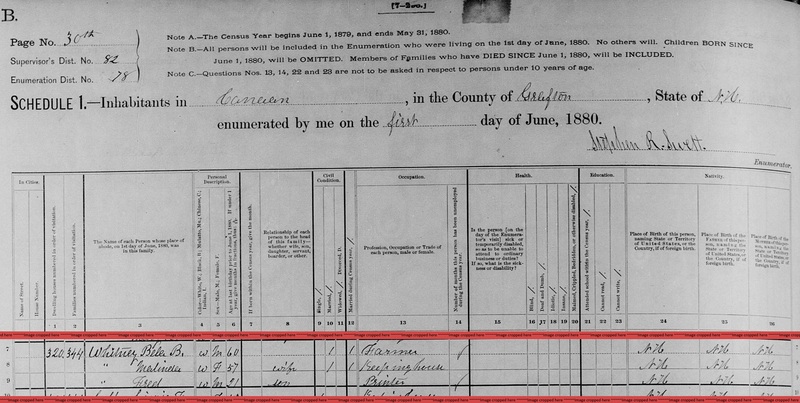 "United States Census, 1880," database with images, FamilySearch (https://familysearch.org/ark:/61903/1:1:MH6L-C1C : 11 August 2016), Andrew Whitmore, Springfield, Hampden, Massachusetts, United States; citing enumeration district ED 313, sheet 148D, NARA microfilm publication T9 (Washington D.C.: National Archives and Records Administration, n.d.), roll 0536; FHL microfilm 1,254,536. "Massachusetts Marriages, 1695-1910," database, FamilySearch (https://familysearch.org/ark:/61903/1:1:FHDV-23T : 4 December 2014), Ralph Parker Whitmore and Alberta Gertrude Thurber, 11 Jun 1898; citing reference 2850; FHL microfilm 819,807. "Massachusetts Marriages, 1841-1915," database with images, FamilySearch (https://familysearch.org/ark:/61903/1:1:N44N-X4C : 17 February 2016), Ralph P. Whitmore and Alberta G. Thurber, 11 Jun 1898; citing , Boston, Massachusetts, United States, State Archives, Boston; FHL microfilm 1,843,709.
living at Canaan, Grafton County, New Hampshire. "New Hampshire, Birth Records, Early to 1900," index and images, FamilySearch (https://familysearch.org/pal:/MM9.1.1/FL55-6FN : accessed 23 Nov 2012), Bela Butler Whitney, 21 Oct 1819. "New Hampshire, Marriage Records, 1637-1947," index and images, FamilySearch (https://familysearch.org/pal:/MM9.1.1/FLH8-4SF : accessed 23 Nov 2012), Bela B. Whitney and Malinda Darling and null, 1880. 1880 United States. Census Office. 10th census, 1880 federal population census, Washington, District of Columbia: National Archives and Records Service, ([19--]) , Census Place: Canaan, Grafton, New Hampshire; Roll: 764; Family History Film: 1254764; Page: 110B; Enumeration District: 078; Image: 0225. "New Hampshire, Death Records, 1654-1947," index and images, FamilySearch (https://familysearch.org/pal:/MM9.1.1/FSLN-R9M : accessed 23 Nov 2012), Bela B Whitney, 24 May 1897.
living at Worcester, Worcester County, Massachusetts. Massachusetts Vital Records, 1841-1910, , Worcester > Births, Marriages and Death > 1333. Newton (Mass. 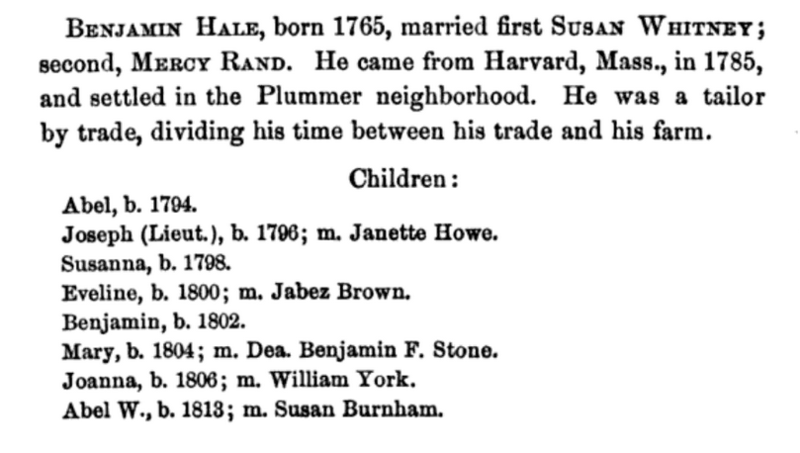 ), Vital records of Newton, Massachusetts, to the year 1850, Boston: New England historic genealogical society, at the charge of the Eddy town-record fund, (1905) , p. 210. Newton (Mass. ), , p. 521. Newton (Mass. ), , p. 224. Newton (Mass. ), , p. 223. Susanna died on March 25, 1820 in Waterford, Oxford County, Maine, at age 43. She was buried in Elm Vale Cemetery, Waterford, Oxford County, Maine. Clayton Rand Adams, Marriage Returns of Cumberland County, Maine, Prior to 1892, Rockport, ME: Picton Press, (1998) , p. 99. The History of Waterford, Oxford County, Maine, , at http://books.google.com/books?id=Qwg1AAAAIAAJ . Portland, ME: Hoyt, Fogg, & Donham, (1879) , p. 250. She was the daughter of Bradford P. Whittemore and Ruth Maria J. Woodward. Place of birth: Wilmot, N.H.
New Hampshire. Registrar of Vital Statistics, Index to marriages, early to 1900, Salt Lake City: Filmed by the Genealogical Society of Utah, (1975-1976) Microfilm #1000976 of the Family History Library, Salt Lake City, Utah: Index to marriages - Calef to Columbia , FHL Number 1000976 Marriage of Eli S. Colby. 1880 United States. Census Office. 10th census, 1880 federal population census, Washington, District of Columbia: National Archives and Records Service, ([19--]) , Census Place: Manchester, Hillsborough, New Hampshire; Roll: 763; Family History Film: 1254763; Page: 152A; Enumeration District: 129; Image: 0305. New Hampshire. Registrar of Vital Statistics, Index to births, early to 1900, Salt Lake City: Filmed by the Genealogical Society of Utah, (1974) Microfilm #1000378 of the Family History Library, Salt Lake City, Utah, birth record of Minnie Belle Colby. (?) Whitten was born perhaps about 1856. 1880 United States. Census Office. 10th census, 1880 federal population census, Washington, District of Columbia: National Archives and Records Service, ([19--]) , Census Place: Manchester, Hillsborough, New Hampshire; Roll: T9_763; Family History Film: 1254763; Page: 5.2000; Enumeration District: 121; Image: 0012. Huldah Whitten was born perhaps about 1733.
living at Pauper House, Natick, Massachusetts. 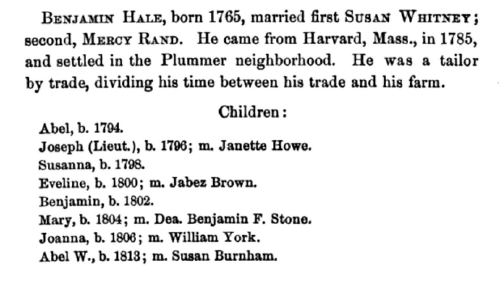 "Massachusetts, Marriages, 1841-1915," index and images, FamilySearch (https://familysearch.org/pal:/MM9.1.1/NWBY-BC3 : accessed 07 Nov 2012), Joseph R. Wight and Lorinda Davis, 1856. William Ward Wight, The Wights: a record of Thomas Wight of Dedham and Medfield and of his descendants, 1635-1890, , at https://books.google.com/books?id=t-QUAAAAYAAJ . Milwaukee: Swain & Tate, (1890) , p. 205. 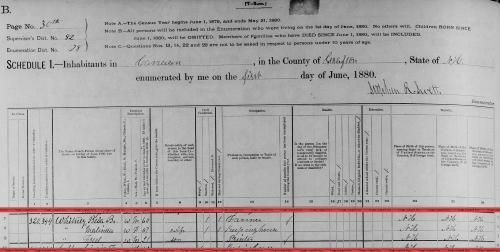 "Massachusetts, State Census, 1865," index and images, FamilySearch (https://familysearch.org/pal:/MM9.1.1/MQCK-MC3 : accessed 08 Nov 2012), Lorinda Wight in household of Joseph R Wight, Natick, Middlesex, Massachusetts. Ancestry.com, U.S. City Directories, 1821-1989 (Beta), [database on-line]. Provo, UT, USA: Ancestry.com Operations, Inc., (2011) , Massachusetts > Salem > 1884 > Salem, Massachusetts, City Directory, 1884 > 561.